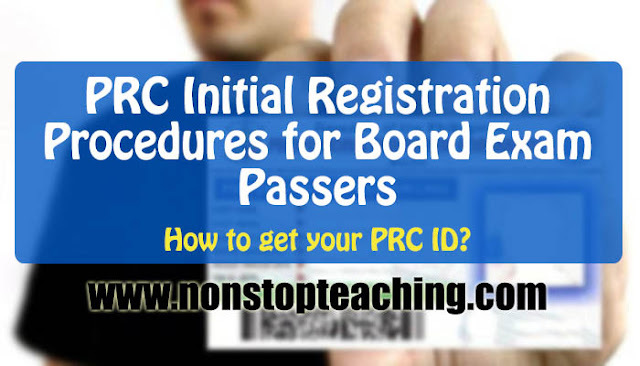 ATTENTION: Due to the updates in PRC's Website, this tutorial has been updated. You can read the updated tutorial from the link below. 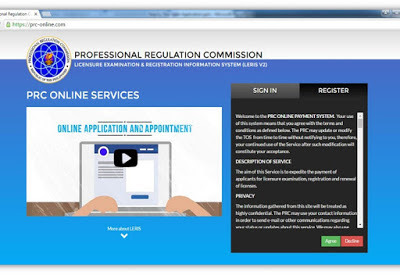 This article will give you information about the process for the PRC Online Registration for board exam passers. 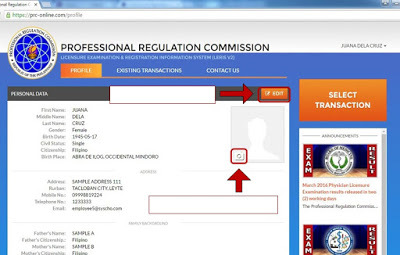 This registration procedures are for the Issuance of Professional ID Card and Certificate of Registration. 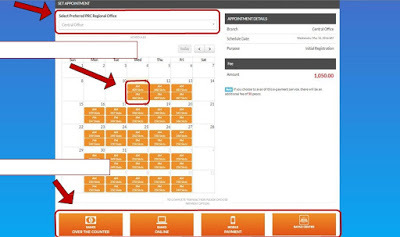 If the registrant is first timer, hit the ‘Register’ tab and start filling out the form. Registrant must use his/her own email account and is only allowed to use one valid email account per registrant. 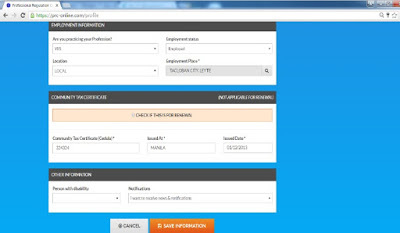 NOTE: You can use the account that you've created during the filing for the Examination. Just sign-in your account and proceed to STEP 10. You can also simply register for a new account and follow the whole steps. SIGN UP: Complete the following details (First Name, Suffix, Middle Name, Last Name, Gender, Civil Status, Birthdate, Email Address, Password and the Confirmation of Password). Do not forget to check the 'I accept the Terms of Service' checkbox, and then press the 'Sign up Now' button. 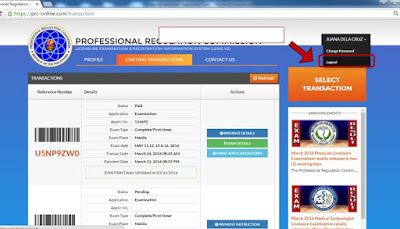 Registrants must read the Terms of Service and click ‘Agree’ if the registrant wants to continue. 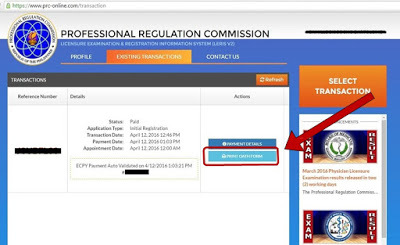 ACCOUNT VERIFICATION: The registrant will receive a verification email from PRC, and must be verified by the registrant before proceeding. 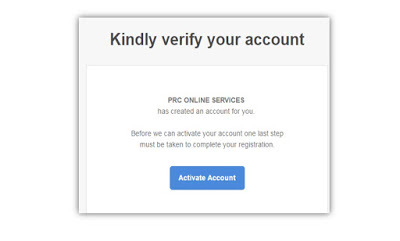 In doing so, open the email and locate the verification mail from PRC online services, then click the 'Activate Account' button. SIGN IN: If the user/registrant has already registered before, refer to the ‘Sign-In’ tab. Enter the email address and password and press the 'Sign-in' button. PROFILE: Upon successful verification via email and signing-in successfully, registrant can now complete the 'Profile' page. Make sure that the information provided is accurate. In input forms where 'Search' button appears, don't type any text. Just select what is provided in the dropdown list. One final verification message for 'First Name, Middle Name and Last Name' will appear once the 'Save Information' button is clicked. Make sure all details are correct since the registrant is not allowed to edit these information anymore after clicking 'Yes' button. The summary will appear after clicking the 'Yes' button. 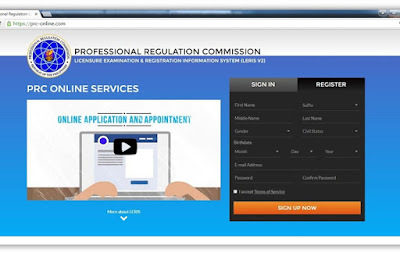 At this page, registrant may still edit other information except for the 'First Name, Middle Name and Last Name' section. UPLOAD PHOTO: Click the upload photo icon and upload the picture stored in the registrant's device. Please make sure to follow the photo requirements. 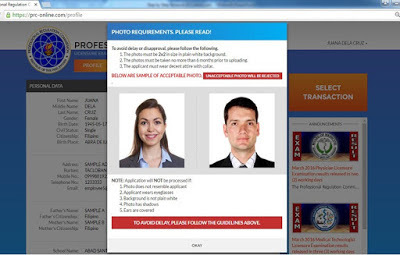 Dos: The photo must be 2 x 2 in size in plain white background, must be no more than six months before uploading and the registrant must wear decent attire with collar. 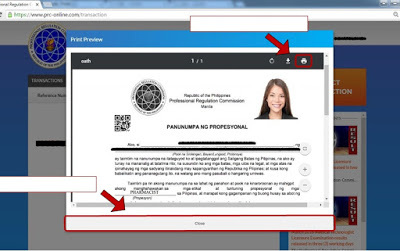 Don'ts: The photo will not be processed if it does not resemble the registrant, if the registrant wears eyeglasses, background of the photo is not plain white, ears are covered and the photo has shadows. 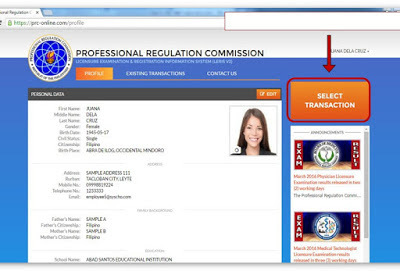 After reading the rules in uploading photo, the registrant must click 'Okay' button. The uploading page will appear next. Upload the photo using the computer or phone directory. After successful upload, click on the 'Initial Registration' button, choose 'Examination'. Select your profession and enter the Application Number found on your Notice of Admission (NOA) and click the 'Proceed' button. Bank Over the Counter Payment. 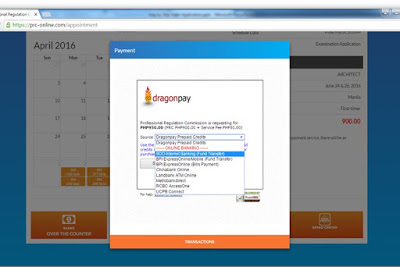 If the registrant chooses this option, he/she will be asked about the preferred bank(s) for payment (e.g. Banco de Oro, BPI). Click the 'Select' button. A confirmation message will appear with a Reference Number. Copy the reference number. Click on the link for detailed payment instruction. Online Banking Payment. 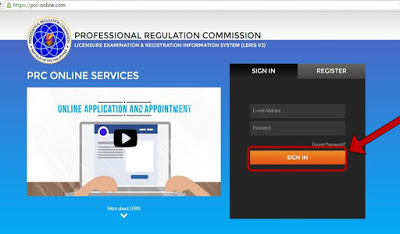 If the registrant chooses this option, he/she will be asked about the preferred bank for payment (e.g., Banco de Oro Internet Banking, BPI Expressonline, Chinabank Online, etc.). Click the 'Select' button. A confirmation message will appear with a Reference Number. Copy the reference number. Click on the link for detailed payment instruction. 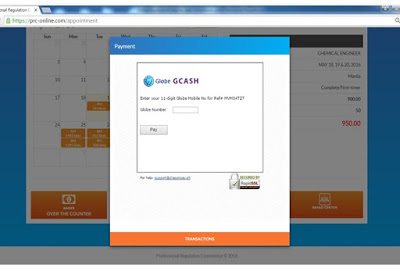 Mobile Payment (via GCash): If the registrant chooses this option, he/she will be asked about his/her GCash account by entering the mobile number. 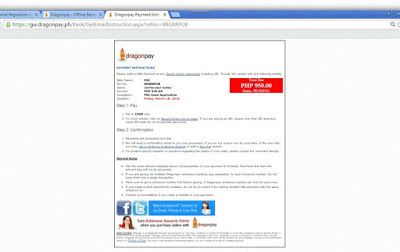 (e.g., 09171234567), then click the 'Pay' button. A confirmation message will appear with a Reference Number. Copy the Reference Number. 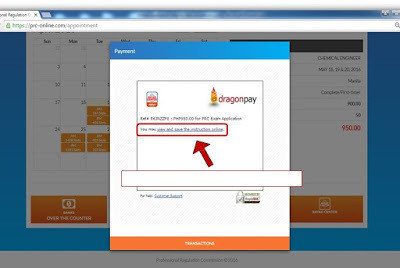 Click on the link for detailed payment instruction. 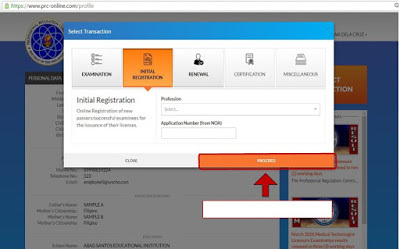 Bayad Center/ Non Bank Over the Counter: If the registrant chooses this option, the confirmation will appear immediately. Copy the Reference Number. 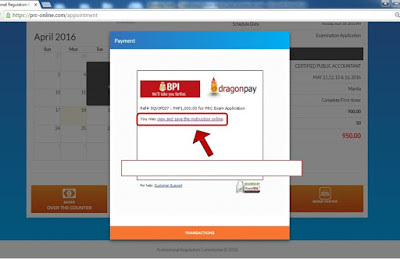 Click on the link for detailed payment instruction. 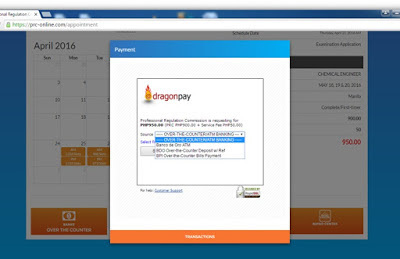 STATUS VERIFICATION: After the payment, the registrant can verify the status of application payment by clicking on 'Existing Transaction' tab. 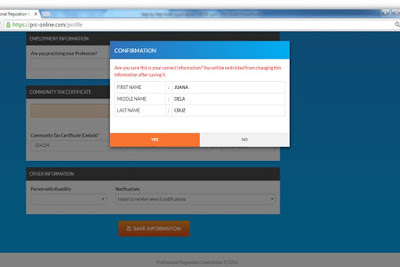 In this page, the registrant can print the 'Oath Form'. The 'Close' button is below to exit the display. This is one of the papers that you have to bring at the PRC Office. LOG-OUT: To exit, click on the name at the upper right corner and click the 'Logout' button. PRC reminds registrants to always logout their account to avoid unauthorized access which may lead to identity theft and other malicious actions. 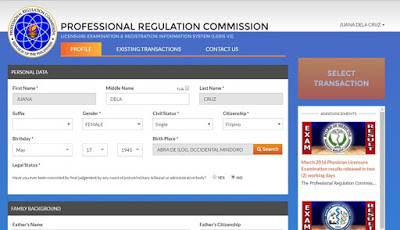 Finished Registration: The registrant can proceed on the appointment date and bring the accomplished 'Oath Form'. This is for those aspiring teachers who'll take the LET this coming September 2019. I guess some of them are fresh graduates from various Colleges and Universities and some are retakers. 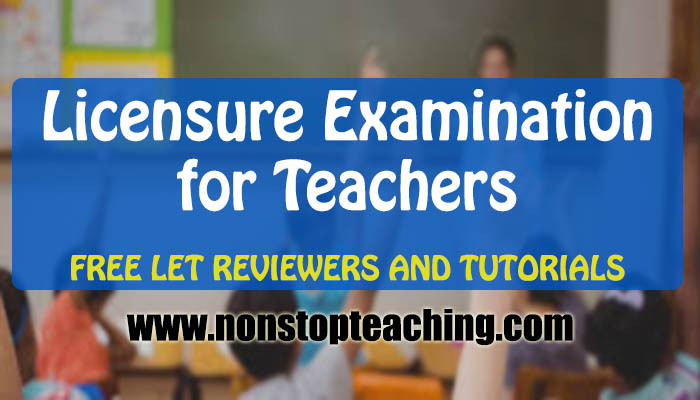 I know that lots of you are still wondering how to apply for the Licensure Examination for Teachers, that's why I prepared this simple compilation of tutorials and reviewers just to give you info that you need for the LET. First of all, you have to read the following articles for you to have a guide on how to apply for the LET. Exam Preparation: What to Bring and What to Wear? You may also try these free LET Reviewers and Answer Sheet to prepare yourselves.